Havanese. Havanese And Havanese Dogs Bible Includes: Havanese Puppies, Havanese Dogs, Havanese Breed, Havanese Rescue, Finding Breeders, Havanese Care, Mixes, Bichon Havanese, Havapoo & More! Everything you need to know about Havanese from Havanese Puppies to adult Havanese Dogs, this is Your definitive Havanese Dog Guide. As a Havanese Dog lover the author enjoys advising on all aspects of Havanese Care including: the Havanese, Havanese Puppies, Havanese Dogs, Havanese Rescue, Havanese Breeders, Havanese For Sale, Havapoo, Care & More! Everything you need to know about the Havanese - from Havanese Puppies through to adult Havanese, this is the definitive Havanese Book. Another informative and entertaining title from Susanne Saben! As a Havanese lover- Susanne enjoys advising on all aspects of Havanese Dogs from Havanese Puppies through to adult Havanese Dogs, Havanese Rescue, the Havanese Breed and its history, Havanese Dogs for Sale, Havanese Temperament, Havanese Training, Havanese Grooming. Also included is full information on the other types of Havanese Mix such as Havapoo Puppies & the Havanese Poodle Mix, Bichon Havanese, Teacup Havanese, Havanese Shih Tzu Mix and Many More. Whether you are considering a Havanese for the first time, or a seasoned Havanese owner, the tricks and tips within this guide will prove invaluable. 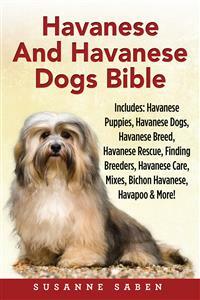 This book is a must have guide for anybody passionate about the Havanese. The book is written in an easy to read and understandable style. In a straight forward, no nonsense fashion, Susanne Saben covers all aspects of the Havanese, Havanese Dogs, Havanese Puppies for Sale and Havanese Breeders, Havanese Adoption, Havanese Rescue, Grooming Havanese, Havanese Temperament, Cuban Dog History, Havanese Terrier, Havanese Dog Prices, Havanese Bichon Mixes, Havamalts, Havanese Care, Havanese Old Age, Havanese Training, Havanese Feeding, & More! Includes Havanese Puppies, Havanese Dogs, Havanese Breed, Havanese Rescue, Finding Breeders, Havanese Care, Mixes, Bichon Havanese, Havapoo, And More! Disclaimer and Legal Notice. This product is not legal or medical advice and should not be interpreted in that manner. You need to do your own due diligence to determine if the content of this product is right for you. The author, publisher, distributors, and or/affiliates of this product are not liable for any damages or losses associated with the content in this product. While every attempt has been made to verify the information shared in this publication, neither the author, publisher, distributors, and/or affiliates assume any responsibility for errors, omissions, or contrary interpretation of the subject matter herein. Any perceived slights to any specific person(s) or organization(s) are purely unintentional. We have no control over the nature, content, and availability of the websites listed in this book. The inclusion of any website links does not necessarily imply a recommendation or endorse the views expressed within them. DYM Worldwide Publishers takes no responsibility for, and will not be liable for, the websites being temporarily or being removed from the Internet. The accuracy and completeness of the information provided herein and opinions stated herein are not guaranteed or warranted to produce any particular results, and the advice or strategies, contained herein may not be suitable for every individual. The author, publisher, distributors, and/or affiliates shall not be liable for any loss incurred as a consequence of the use and application, directly or indirectly of any information presented in this work. This publication is designed to provide information in regards to the subject matter covered. The information included in this book has been compiled to give an overview of the topics covered. The information contained in this book has been compiled to provide an overview of the subject. It is not intended as medical advice and should not be construed as such. For a firm diagnosis of any medical conditions you should consult a doctor or veterinarian (as related to animal health). The writer, publisher, distributors, and/or affiliates of this work are not responsible for any damages or negative consequences following any of the treatments or methods highlighted in this book. Website links are for informational purposes only and should not be seen as a personal endorsement; the same applies to any products or services mentioned in this work. The reader should also be aware that although the web links included were correct at the time of writing they may become out of date in the future. Any pricing or currency exchange rate information was accurate at the date of writing but may become out of date in the future. The Author, Publisher, distributors, and/or affiliates assume no responsibility for pricing and currency exchange rates mentioned within this work. With long silky fur and a friendly personality, the Havanese is by far one of the best dog breeds out there. As the proud owner of a Havanese dog myself, I can attest to the fact that these little dogs are the perfect companion pets. Havanese dogs are energetic and full of life, but they are also very smart and trainable. If you are looking for a new pet, I cannot recommend the Havanese highly enough. The Havanese is an excellent choice if you are interested in a small-breed dog but there are some things you should know about the Havanese breed before you decide if it is right for you. Having owned my own Havanese for several years, I understand what it takes to keep these dogs happy and healthy – and I am going to share that information with you! By the time you finish this book, you’ll know for sure whether a Havanese is the right dog for you and you will be well on your way to becoming the best dog owner you can! My Havanese, Bailey, has brought endless joy to my life, but he is a little higher maintenance than other dogs I’ve had in the past. If you want to keep a Havanese puppy or an adult Havanese, you should learn all that you can about these dogs. In this book, you will find a combination of practical information about Havanese dogs as well as plenty of personal anecdotes and tidbits from my years of experience with the breed. So, if you are ready to learn more about the Havanese, just turn the page and keep reading! 1.) What is a Havanese Dog or Cuban Dog? 1.) Do You Need a License for an Adult Havanese? 2.) How Many Havanese Dogs Should You Get? 3.) Do Havanese Dogs Get Along with Other Pets? If you have picked up this book, then I have to assume that you are interested in a fluffy little dog called the Havanese. If so, I want you to know that you are on the right track! I can say from personal experience that there is no better dog breed than the Havanese, and I have worked with many dog breeds in my day, so that is saying something! I am the proud owner of a Havanese myself (his name is Bailey), and I wouldn’t give him up for anything in the world! Some people might say that all fluffy dogs look alike but, to me, the Havanese is a very unique and wonderful breed. Not only are these little dogs smart and energetic, but they are very affectionate with their family, and they love to cuddle. Bailey and I spend most evenings together on the couch, catching up on our favorite TV shows. Havanese dogs are friendly, and they do not have the same tendency to bark at strangers that many small dogs do – this is important to me because I love having friends over! Simply put, if you are looking for a small dog that doesn’t have some of the negative small dog characteristics, the Havanese might be right for you. I know how hard it can be to choose a dog breed, especially when there are so many wonderful options out there. In this book, I hope to provide you with all of the information you need to decide whether or not the Havanese dog is right for you. I will teach you about Havanese temperament and personality as well as the history of the breed and tips for Havanese training. By the time you finish this book, you will have the information you need to decide if the Havanese is a good fit for your family, even if your family is just you. If it is, then you will also have a firm foundation of knowledge to build on, helping you to become the very best Havanese owner that you can be. So what are you waiting for? Turn the page to keep reading about the beautiful Havanese breed! Coat – The hair covering of a dog; some breeds have two coats, and outer coat and undercoat; also known as a double coat. Examples of breeds with double coats include German Shepherd, Siberian Husky, Akita, etc. Dock – To shorten the tail of a dog by surgically removing the end part of the tail. Double Coat – Having an outer weather-resistant coat and a soft, waterproof coat for warmth; see above. Shedding – The natural process whereby old hair falls off the dog’s body as it is replaced by new hair growth.